Having missed the opening Round of the Chinese National Rally Championship last season Dean Herridge made amends last weekend when he snatched fourth outright at the season-opening, all-tarmac Rally Shanghai. Debuting Subaru Rally Team China’s brand new specification Subaru Impreza WRX Herridge and co-driver Chris Murphy began cautiously, eager to test the potential of the new vehicle without risking mechanical casualties, sitting comfortably in the top six at the end of Saturday’s stage while Brit David Higgins blasted into the lead in his Mitsubishi. “Our times have been improving with every stage, a very encouraging start,” said Dean at the end of the opening day. The short, sprint style stages were described as the equivalent to an Australian Rally Championship Super Special Stage, and suited the more highly developed Mitsubishi Evo 9’s and older spec Impreza WRX’s. Moving up the order after local ace Xu Lang retired on Sunday morning Herridge edged in on a podium finish right up until the final stage, but fell tantalizingly short, in the end by just 8 seconds. “Frustrating in a way, but on the other hand to get that close in a brand new car is incredibly positive,” Dean exclaimed at the finish. 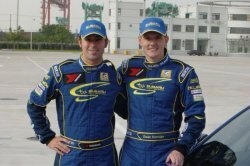 Higgins maintained the lead despite the best efforts of Kiwi driver Tony Green who finished second ahead of local driver Liu Caodong. This entry was posted on Sunday, June 1st, 2008 at 9:20 pm.